Motorola Xoom owners who own a Wi-Fi model who were promised that they would get the get the latest iteration of Android OS, the Android 4.1 Jelly Bean are now receiving OTA to Android 4.1.1 OS making the tablet, the first 10 inch lucky device to receive the update. The update weighs around 79 MB (might differ from region to region) and would bring in loads and loads of new features to the Motorola Xoom. With this update the build of the OS jumps to JRO03H and Kernel version reaches 2.6.39.4-gfd343aa. We currently do not have complete information on the changelog of the Motorola Xoom Android 4.1 Jelly update but we’ll update this article as soon as we gave more information. But the tablet is bound to receive a majority of the features that Google listed in the Android 4.1 Jelly Bean changelog which can you find here. 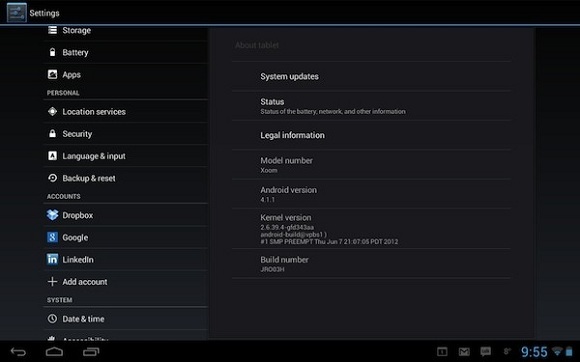 So if you own a Motorola Xoom Wi-Fi tablet, it is time to shoot up the update button.